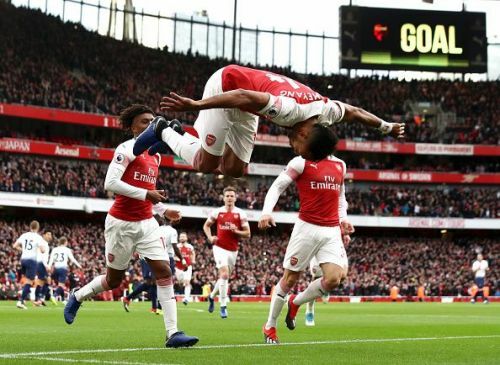 It was a thrilling encounter between these two great rivals, as Arsenal came out on top at the Emirates in the latest edition of the North London Derby. There was much talk about how Spurs will derail Arsenal's momentum and hand them their first loss in 19 fixtures, but Unai Emery's men were by far the better and hungrier side on the night, coming away with the three points and the bragging rights over their derby opponents. Arsenal started the game with great intensity, and all their pressure paid off, as Belgian international Jan Vertonghen handled the ball in his own area, and Pierre Emerick Aubameyang calmly slotted past a fumbling Lloris to give the Gunners an early lead. Tottenham isn't one to go down without a fight, and they instantly looked to get back into it but had to bide their time before Eric Dier headed in Christian Ericksen's freekick past the near post of the sprawling Bernd Leno at the 30th minute. They kept the pressure on Arsenal's backline, and Rob Holding dived in at Son's feet at the 35th minute, which led to the referee awarding another penalty, but this time to the other team. (Rather controversially, as Son took a page from Neymar's book to make the most of whatever little you get). Harry Kane slotted his spot-kick home rather easily, and the men in white would go in at halftime with a slender one-goal advantage. 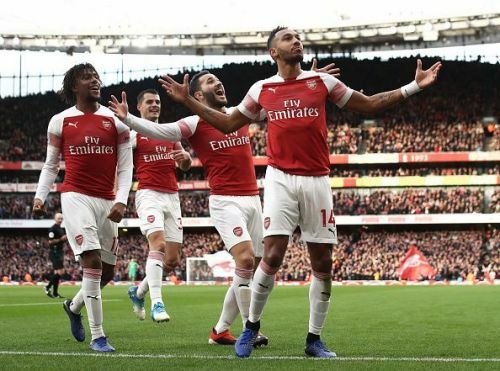 Arsenal came out of the tunnel with Emery having made two changes, as both Iwobi and Mkhitaryan were taken off in place of Ramsey and Lacazette, and it proved to be a masterstroke from the Spaniard, as both of them made key contributions, with Ramsey assisted the equaliser and Lacazette scoring the third goal for the Gunners. Aubameyang later found summer signing Lucas Torreira in acres of space, and the Uruguayan made no mistake in placing his shot far from Lloris into the corner of the net, handing the Gunners a comfortable 2 goal lead after having gone down by a goal before halftime. Here are 3 reasons why Spurs came away with nothing to show for. Pierre Emerick Aubameyang sits atop of the Premier League scoring charts with 10 goals to his name after 14 matchdays, and his performance tonight was one that will live long in the memory of Arsenal and Tottenham supporters tonight, as he was the most crucial player for the home side. He scored a penalty, a worldie from the edge of the box and then assisted the fourth goal of the night as Tottenham were swept away in emphatic fashion in the second half. It was one of the best performances from an Arsenal striker, or an Arsenal team in the north London derby in a very long time.